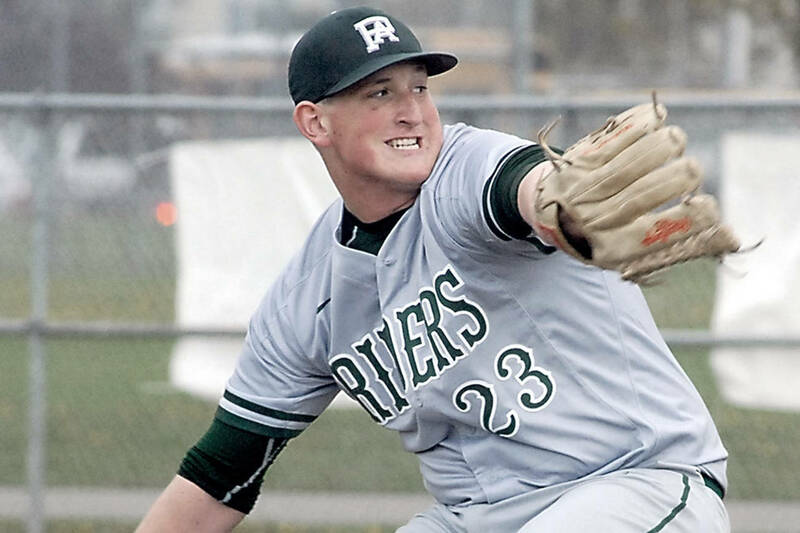 Mark Krulish/Kitsap News Group Brody Merritt got the start on the mound for Port Angeles and allowed three hits in four shutout innings to get the win in the Riders’ 2-1 victory against North Kitsap. POULSBO — Brody Merritt and Seth Scofield combined to allow one run on six hits as Port Angeles took the upper hand in the Olympic League baseball title chase with a 2-1 win over North Kitsap on Friday. Merritt went four innings, allowing two hits, three walks and no runs while striking out three. He escaped trouble in the first and second innings when the Vikings put runners on first and second in both innings thanks to three walks and a hit. Merritt was able to strand North Kitsap each time, striking out Colton Bower to end the first and got Jared Reister to fly out to end the second. Center fielder Tyler Bowen also robbed Issac Richardson of an extra-base hit in the third inning with a full-extension dive. Scofield came on in relief and went three innings, giving up one run on four hits and striking out one. North Kitsap opened the bottom of the seventh with a pair of singles, a sacrifice bunt and a sacrifice fly to cut the Riders’ lead to 2-1. But with the tying run at second, Scofield got the Vikings’ Chris Schuchart to ground to second to end the game. Port Angeles scored both of its runs in the third inning when Gavin Guerrero singled home Wyatt Hall, who had lead off with a single, moved to second on a throwing error and to third on a Daniel Basden bunt. An Ethan Flodstrom sacrifice fly later brought home Basden for a 2-0 lead. Midway through league play, Port Angeles (6-0, 9-3) holds a one-game lead ahead of North Kitsap (5-1, 9-4). Friday’s game was originally scheduled for Civic Field in Port Angeles, but rain made the Civic Field diamond unplayable. The teams swapped home games and the Riders will now host the Vikings in the league finale for each team April 29. Port Angeles hosts North Mason (3-3, 6-6) on Monday. Port Angeles — Merrit 4IP, 3H, 3BB, 3K; Scofield 3IP, 3H, R, ER, K.
North Kitsap — Richardson 6.2IP, 6H 2R, 0ER, 3BB, 5K; Gowin IP. Port Angeles — Guerrero 1-3, RBI, BB; Flodstrom 1-3, RBI; Hall 1-3, R; Basden 0-3, R; Wood 1-4; Bowen 1-3; Lunt 1-1. North Kitsap — Richardson 0-3, RBI; Schuchart 1-3, BB; Schmidt 1-1, R; Alexander 1-3; Larsen 1-2; Bower 1-3; Chmielewski 1-3. SEQUIM — The Wolves rallied from a 3-2 deficit with a seven-run fourth inning and 10-runned the Trojans on Friday. Silas Thomas earned the win on the mound going four innings and allowing three runs, two earned, on six hits with four strikeouts. Thomas also went 3 for 4 with three runs and an RBI. Johnnie Young was 2 for 4 with two runs and two RBIs for Sequim and Hayden Eaton drove in a pair of runs for the Wolves (4-2, 8-4). Sequim hosts North Kitsap on Monday. Sequim — Thomas 4IP, 6H, 3R, 4K; Oliver 2IP, H, 2K. Olympic — Heino 2-3, R, HR, RBI; Andrews 2-2, RBI; Finnegan 1-3, 2B. Sequim — Thomas 3-4, 3R, RBI; J. Young 2-4, 2R, 2RBI; Oliver 2-4, 2R, RBI; Pozernick 1-2, R, RBI; Eaton 1-2, BB, SB, R, 2RBI; Barnett 1-2, BB, R, RBI; M. Young 1-3, BB, R, RBI; Grubb 1-4, R, RBI. BELFAIR — The Cowboys broke up the Bulldogs’ shutout bid by scoring three runs with two outs in their final turn at bat, but couldn’t rally for more in a nonleague loss Friday. Chimacum (0-1, 4-8) will host Kingston on Monday in another nonleague game. Chimacum — Dotson 3IP, 4H, 6R, 2ER, BB, 4K; Purser 3IP, 3H, 3ER, 2BB, 3K. Chimacum — Smith 1-4, R, RBI; Purser 0-2, 2BB, 2SB, R; Brebberman 1-3, R; Lawson 1-2, R.
CHIMACUM — The Riders (5-3) edged the Cowboys (1-7) on Friday. Port Angeles claimed both matches that went to the decisive third set as Casandra Shamp edged Makaela Caskey 6-1, 4-6, 7-5 in the No. 1 singles match and Angelina Sprague and Brielle Keywood rallied to beat Sophie Patterson and Tiffany Bell 4-6, 6-4, 6-3. No. 1: Casandra Shamp (PA) def. Makaela Caskey (C) 6-1, 4-6, 7-5. No. 2: Madison Hess (C) def. Kailey Droz (PA) 6-4, 6-3. No. 3: Hannah Reetz (PA) def. Denise Lopez (C) 6-2, 6-1. No. 1: Grace Yaley/Renee Woods (C) def. Emily Rygaard/Dency Patel (PA) 6-2, 6-2. No. 2: Ellie Getchell/Eden Critchfield (PA) def. Sophia Arnaitz/Isabelle Hill (C) 6-2, 6-2. No. 3: Olivia Mattern/Mica Briggs (C) def. Reagan Critchfield/Hannah Basden (PA) 6-4, 6-4. No. 4: Angelina Sprague/Brielle Keywood (PA) def. Sophie Patterson/Tiffany Bell (C) 4-6, 6-4, 6-3. SILVERDALE — The Wolves’ top doubles pair Kalli Wiker and Jessica Dietzman instead served as Sequim’s No. 1 and No. 2 singles players and each earned straight-set wins as the Wolves swept the Eagles. Sequim (9-0) hosts Chimacum on Monday. No. 1: Kalli Wiker (S) def. Taylor Bruce (K) 6-1, 6-1. No. 2: Jessica Dietzman (S) def. Anna Wells (K) 6-0, 6-1. No. 3: Amanda He (S) def. Kristen Powell (K) 6-2, 6-2. No. 1: Ashley Rosales/McKenna Hasting (S) def. Emma Heckert/Madita Schoenberge (K) 6-1, 6-0. No. 2: Isabella Hugoniot/Olivia Preston (S) def. Hannah Catt/Kelisha Harris (K) 6-0, 6-2. No. 3: Arlene Law/Emily Bundy (S) def. Aleah Catt/Whitney Henrichsen (K) 6-2, 6-1. No. 4: Eden Johnson/Melissa Porter (S) def. Abby Hainlen/Jess Haynes (K) 6-1, 6-1. Mark Krulish/Kitsap News Group Port Angeles’ Tanner Lunt hits a pinch-hit single in the sixth inning of the Riders’ 2-1 win over North Kitsap.